It’s Christmas Eve. Duh. I’m sitting around the table with my family — Grandpa’s making his famous rouladen, Mom’s making deviled eggs, Grandma’s making her delicious dumpling soup… it’s a typical Christmas. A lot of the traditions in our family (as you can probably gather) revolve around food. It’s not Christmas without Grandpa’s rouladen. It’s not a birthday without a cheesecake sampler (a story for another day). And it’s not breakfast without my dad’s crepes. My dad has been The Breakfast Maker for as long as I can remember. Weekend mornings, for him, are perfect times to pull out the griddle and make about 4,598 pancakes (he’s on a pumpkin pancake kick lately, and I have no objections). Sometimes he makes omelets and bacon. 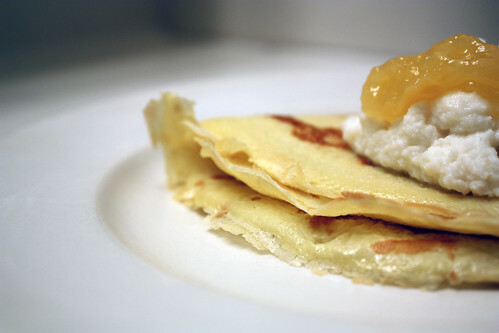 And sometimes (my favorite times), he makes these crepes — aka, thin, pancake-like round things that taste like magic. It’s taken me a while to get the recipe down so it’s close to his — he knows it like the back of his hand so, like most family recipes, it’s always “add a little bit of this” and “pour in a smidge of that.” None of this makes sense, of course, if you don’t know the “feel” of the perfect batter. Once you’ve got that down, then, bits and smidges make tons of sense. Now that I’m on the side of understanding my Dad’s description of this recipe, there’s not much I can tell you about amounts of ingredients other than the “feel” of the batter, which should be more liquidy than pancake batter but not as liquidy as a bunch of beaten eggs. I know this isn’t much help to you, and it’s imperative that you make this recipe part of your own familial traditions, so I’ve done my best below to give exact amounts of ingredients. But, like I’ve said, it’s all about the “feel.” Go with that more than anything. Debrief: My dad swears by using corn oil in the skillet when he makes his crepes, but I’ve been using vegetable oil this whole time and haven’t noticed a difference in taste or result. So it’s up to you, I guess. In a large bowl, beat eggs together. Add milk and mix. Add sugar and whisk in about a 1/2 cup flour at a time, making sure you get rid of all the lumps (be skimpy with how much flour you add in at a time, so you don’t make the batter too thick — if it DOES get too thick, add milk). Keep whisking together ingredients until the lumps are gone and the thickness of the batter is slightly thinner than pancake batter. Heat a large or medium skillet to medium heat. Pour a very, very small amount of oil, enough to barely cover the bottom of the skillet (seriously, about 1/2 tsp at a time). Using a soup ladle, ladle in about 1/2 to 3/4 cup of batter into the skillet and, holding the skillet handle, roll the batter all the way to the edges until you have a nearly paper-thin circle of batter in the bottom of the skillet. 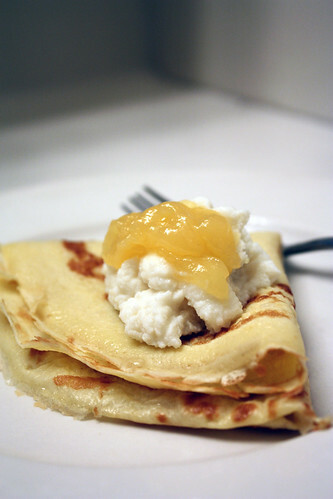 Cook until small bubbles begin to form on the top of the crepe or until the edges start to curl up, about 2 minutes. Flip over using a turner, and heat the other side for about 1 minute. The crepe should be cooked through and have light brown spots on it. Place on a plate and repeat above process until all batter is used up. Serve warm. 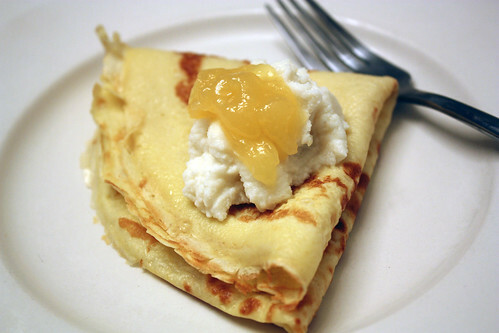 Extra punches: You can really put anything your heart desires into these crepes — jelly, jam, sour cream, cottage cheese, cheese and ham, ricotta and lemon curd (as I did above, in the pictures) — it’s up to you. 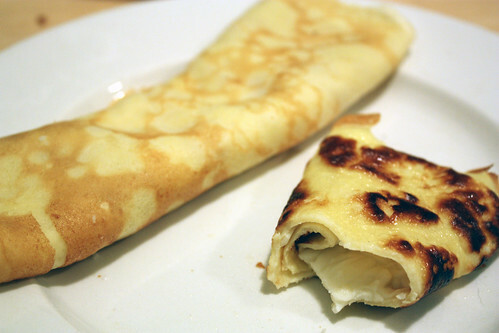 You can either spread the fillings on the insides of the crepes and roll them up, too (see pics) or fold the crepe in quarters (also, pics) and spread the fillings on top. Julie — Great! Hope it works out for you! They’re super easy to make.